Today’s feature foodie photo is of dessert dim sum – filled with sesame seed paste on the outside and lotus paste on the inside – that we tried for lunch while traveling in Hong Kong, China. This is one of my favorite types of dim sum. I tend to love the sweet ones more than the crispy or savory options. 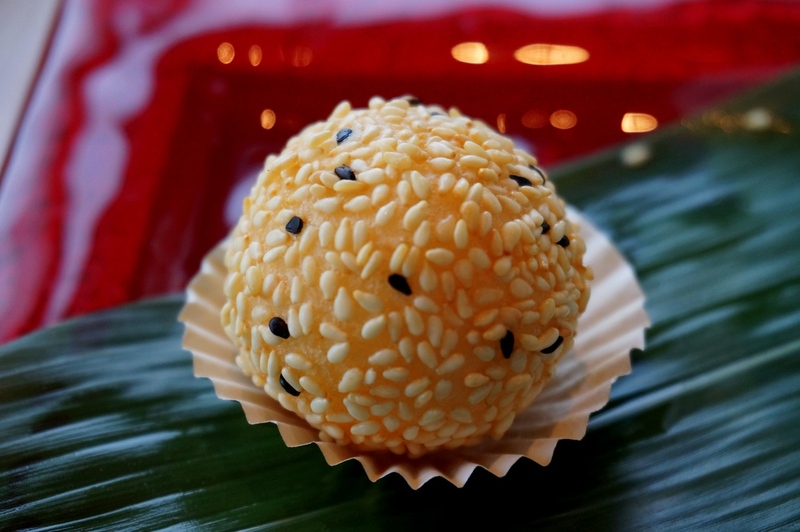 Crispy on the outside and gooey on the inside, Jian Dui is a type of friend Chinese pastry made from a combination of glutinous rice flour sprinkled with sesame seeds on the outside. It’s both crispy and chewy given its different consistency from outer to inner layer. Apparently the origin of these tasty little treats can be traced back to the Tang Dynasty. In Hong Kong it is one of the most standard pastries. You can literally find them being sold outside on the street or at sit down dim sum restaurants.